Cast your minds back a few months ago, Equifax had a data breach that exposed to hackers the names, social security numbers, credit card numbers, driver’s license numbers, and other sensitive personal information which resulted in a total of 145.5 million consumers impacted by this cyber security breach after the forensic investigation concluded. Guest blog written by Ka Kay Achacoso. The resulting outcry from potentially affected businesses and consumers underlines the extremely heavy impact when confidential data gets into the wrong hands. The Equifax incident, along with the growing number of data breach incidents reported, is evidence that data theft is persistent and is growing more sophisticated. Data breach on the type of devices running the VxWorks real-time operating system (RTOS) can mean exposing passwords into a larger system, or giving away keys to communication codes, or exposing intellectual property that allows rivals to replicate the device’s design. Protection of device data is important for more than security of a single device. Keeping device data secure is important for the integrity for the bigger system to which the device belongs. The main attack surfaces for data breaches are either where the data is travelling over the network (data in motion), or where the data is physically stored (data at rest). Both are important to protect. This blog discusses how VxWorks addresses protection of data at rest. If a hacker manages to retrieve the contents of a disk containing sensitive information, either by duplicating the bytes in the disk, or by obtaining the physical memory of the disk, the contents would look like random disorderly bytes that cannot be understood. A decryption key, derived from a passcode, is needed to decrypt the disk into an intelligible form. If the hacker also manages to obtain the files holding passcode information, that file will also be meaningless. The passcode information can only be decoded by the original hardware. Not even the manufacturer who entered the passcode information in the first place can decode that file without the original hardware. On Intel Architecture platforms, VxWorks supports the Trusted Platform Module (TPM) technology as the hardware crypto-processor. VxWorks uses the software package tpm2-tss from Intel that implements the Trusted Computing Group Software Stack (TSS) specification to interact with the TPM. More details about TPM support can be referenced in a previous blog about using TPM to seal data here. The TPM data sealing blog talks about TSS to protect individual files. Protecting data using TPM through the use of VxWorks disk encryption and through the use of TSS API directly protect data using TPM. 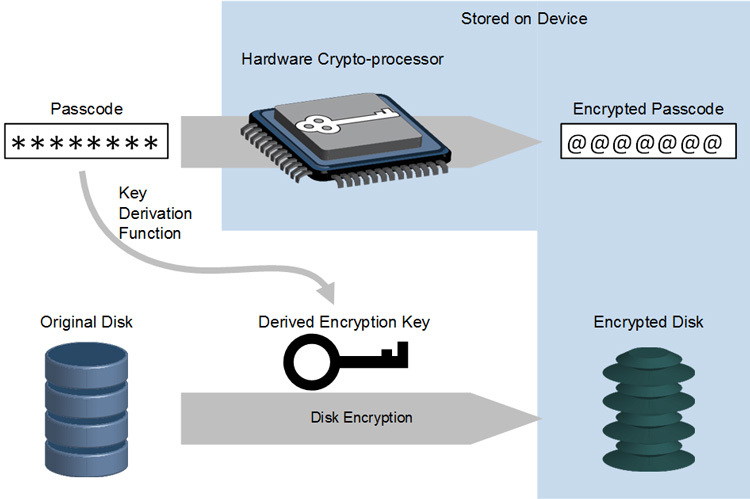 The advantage of using the VxWorks disk encryption method is that the encryption process is transparent to the application as file operations are performed. On NXP Power Architecture platforms, VxWorks supports the blob protocol built into NXP security engines on SEC 5.x modules. These security modules are found on certain micro-controllers such as the NXP T1020 and the NXP T2040. The blob protocol encrypts data with a different key every time it is invoked, and that key itself is encrypted by the secret key-encryption key inside the security engine. The caveat to using hardware crypto-processors is that if the secret master key is cleared, the loss of data is permanent. No one can recover the original passcodes, and no one can recover the contents of the encrypted disk. For some situations, the loss of data is preferable to data ending up in the wrong hands. Nevertheless, organisations should have strong policies in place around when a device can have its crypto-processor cleared. Wind River continues to invest in security technologies in its Internet of Things (IoT) solutions. You can learn more about VxWorks Security Profile here.